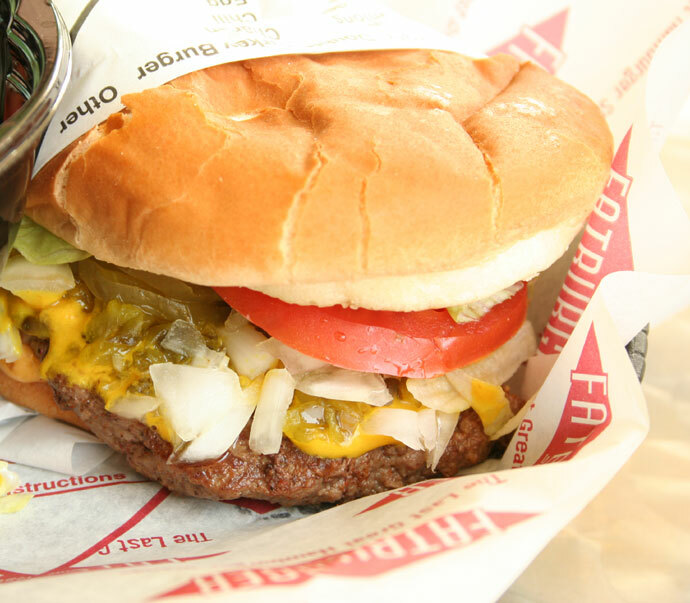 Fatburger (web site, 105-111 Dunsmuir St. Vancouver, phone 604-669-9640) is a popular American fast-food chain that serves burgers, French fries, soft drinks, and milkshakes. Burgers are big, and well, fat. Pictured below is the King Burger (not to be confused with the restaurant Burger King), which is a 1/2 lb burger served with mustard, relish, onions, pickles, tomato, lettuce, mayonnaise, and added cheese (for around $8.00). I’m not usually a fast food fan, but I have to say my burger tasted really good – toppings were fresh and the beef was flavorful. Maybe even the skinniest of us can splurge on a fat burger once in a while! The Dunsmuir location I visited is really close to the Stadium skytrain station and the Vancouver sports stadiums: GM Place and BC Place Stadium. Two other locations in the Vancouver area are: 1101 Denman St. Vancouver, 604-689-8858, and 1995 Lonsdale Avenue North Vancouver, 604-904-4430. 35,898 views. This entry was posted on Friday, September 14th, 2007 at 6:57 pm	and is filed under BC Place Stadium, Burgers, Casual, Chain Restaurants, Comfort food, Downtown, Fast Food, Food Photos, GM Place Stadium, Hamburgers, Lunch, Patio, Restaurant, Students, Take Out, Vancouver, Vancouver Restaurants, Yaletown. You can follow any responses to this entry through the RSS 2.0 feed. You can leave a response, or trackback from your own site.